Ancient Persian nutrition, the cuisine of Persian empires from the 8th century BC to its Muslim conquest in the 7th century AD, appears to have been very similar to modern Iranian nutrition. Herby rice loaded with vegetables and lamb, leavened and unleavened bread flavored with milk, sugar, or herbs, as well as hearty stews brimming with vegetables and goat were staples in the average Persian citizen’s diet. Throughout its history, Persian cuisine was influenced to some degree by both Egyptian and Greek cuisine as well. Rice held a prominent position within ancient Persian nutrition, though not as much as it does in modern day Iran. It could be mixed in or topped with produce such as almonds, pistachios, lentils, carrots, onion, fennel, cilantro, and saffron, as well as meat such as lamb, goat, or chicken (after its introduction in the 5th century BC). These dishes could be fluffy and aromatic or heavy and hearty. While rice was very popular among the Persians, it wasn’t until after the Muslim conquest that it became perhaps the most predominant source of calories within the diet. Fresh bread was another central food for the Persian citizen, likely tied with or sitting just below rice in terms of calories consumed. They typically used wheat, but it was not uncommon to use other grains such as barley. While Persian bread could be complimented with extra ingredients such as milk, fruits, or herbs, its primary source of variation came from its cooking methods. Different processes made the bread light or heavy, leavened or unleavened, and crispy or fluffy, and each of these characteristics would compliment different meals in different ways. With early advancements in agriculture within the Persian empires, fruits and vegetables were bountifully available. Carrots, pumpkins, eggplants, garlic, onions, spinach, and various beans were all likely grown, as well as nuts such as almonds and pistachios. Some of the fruits produced included watermelon, grapes, pomegranates, oranges, lemons, and dates. Fruit, though featured in many main dishes, was often eaten as a dessert. Production of wine within the area predates the Persian empires, reaching back as early as 5000 BC, and as such was quite popular within ancient Persian nutrition. Because Zoroastrianism, the dominant religion of ancient Persia, dictated moderation and balance in all things, overconsumption of wine was not a major issue. As such, most Persian citizens likely benefited from the antioxidant properties without the negative health effects of alcoholic overconsumption. Dairy products were fairly common within ancient Persian nutrition. A dried milk product called kashk, which was used in many dishes, allowed for preservation of dairy ingredients for cooking. It could be rehydrated to make a thick liquid akin to sour cream or yogurt, depending on the method of production used. Cheese was likely fairly popular as well, complimenting many main dishes. Milk seems to have only been drunk in moderation. Zoroastrianism, the religion that dominated Persia before its conversion to Islam in the 7th century AD, dictated abstinence from eating certain creatures considered to be evil, including insects, lizards, and snakes. Besides this, practitioners of Zoroastrianism had no major dietary restrictions. With a wholesome diet consisting primarily of grains and produce and complimented with meat and dairy, there is little doubt that ancient Persian nutrition may have closely matched modern recommendations. The combination of holistic food choices available to the average Persian citizen in tandem with their religious temperance would have provided enough nutrient-dense food to fuel the body without an overconsumption of calories. 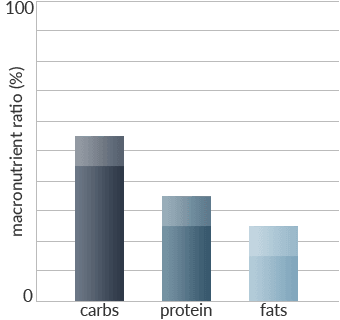 The macronutrient ratios for the average Persian citizen likely hovered around 45-55% carbohydrates, 25-35% protein, and 15-25% fats. Listed below are some foods that would have been commonly found in the ancient Persian’s diet, organized roughly by food group. Batmanglij, N. (2011). Food of life: A book of ancient Persian and modern Iranian cooking and ceremonies. Washington, D.C.: Mage Publishers. Laudan, R. (2013). Cuisine and empire: Cooking in world history. Berkeley, CA: University of California Press. Stanton, A. L. (2012). Cultural sociology of the Middle East, Asia, and Africa: An encyclopedia. Thousand Oaks, CA: SAGE. Shafia, L. (2013). The new Persian kitchen. Potter.